While oil and natural gas development pose inherent environmental and public health risks, concerns about the effects of oil and gas drilling exploration and production have emerged alongside the rapid growth in the use of fracking technology. Potential environmental and social impacts have generated a significant amount of controversy and public debate. The list of potential threats is varied and long. 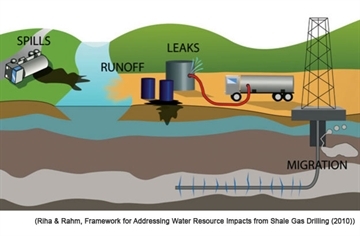 It is important to note that not all of these potential impacts are directly related to the process of hydraulic fracturing itself, rather are a result of the oil and gas extraction process in general. Most of the evidence for the risks is anecdotal at this point and much is still unknown about the long-term impacts. There are many studies underway to evaluate the environmental and public health effects of oil and gas drilling in the 21st century. Contamination of surface, ground, and drinking water with oil and gas, fracking chemicals, or wastewater can occur. There are three main ways that oil and gas development can lead to water contamination. Water withdrawals for water used in fracking hold the potential to cause significant environmental harm. Water withdrawals can lead to wells, springs, and wetlands running dry, lake levels dropping, and reducing stream flow with great harm to wildlife. Michigan has been tracking water use for high volume hydraulic fracturing since 2008. The MDEQ has a Tracking Table that shows approximate groundwater volumes withdrawn for fracking completions. The Tracking Table is available at http://www.michigan.gov/deq/0,4561,7-135-3311_4231-262172--,00.html. Several acres of land per well site are cleared of vegetation and leveled to accommodate drilling equipment, collection and processing equipment, and vehicles. Farm and forest land is being replaced with well pads, roads, pipelines, and other infrastructure. These large areas of cleared land and many miles of roadways can scar the landscape and result in habitat fragmentation. Construction equipment, fracking equipment, and unintentional gas leaks are sources of negative air emissions during the drilling, fracking, and production processes. Also, during the initial fracking period, gas that flows up is often vented into the air or flared. This venting and flaring of gas is the largest source of air pollution from oil and gas extraction. Some methane, a potent greenhouse gas, from natural gas deposits can migrate to the surface through tiny fractures in the ground, and fracking may exacerbate this. Oil and natural gas production and processing accounts for nearly 40 percent of all methane emissions in the U.S., making the industry the nation’s single largest methane source. Additionally, using more oil and gas could deter investment in renewable energy. The use of hydraulic fracturing to open underground natural gas formations has a low risk of triggering earthquakes. While the fracking itself causes tiny ‘micro’ earthquakes, these are virtually undetectable at the surface. If a well is fracked near an active fault, larger earthquakes can be caused, although they are still small. While fracking is not causing most of the induced earthquakes, wastewater disposal in injection wells is responsible for a recent increase in earthquakes, primarily in the central United States. Wastewater injection raises pressure levels because it involves larger volumes of fluid being injected and for longer periods of time. According the United States Geological Survey, a combination of many factors is necessary for injection to induce felt earthquakes, including: the injection rate and total volume injected; the presence of faults that are large enough to produce felt earthquakes; stresses that are large enough to produce earthquakes; and the presence of pathways for the fluid pressure to travel from the injection point to faults. Hydraulic fracturing might pose public health threats to people who live near the wells or are exposed to water contaminated with fracking chemicals or gas. There are claims of headaches, nosebleeds, disorientation, fainting, sick animals, and development of cancer and other chronic diseases. Water contaminated with fracking chemicals and toxic metals likely pose the most significant risk to humans and animals. The chemicals used in the fracking fluid include known carcinogens and some of the chemicals are attributed to endocrine disruption as well as neurological and immune system problems. Water, sand, and chemicals must be supplied to the well site and wastewater produced must be disposed of. As a result, there is often an increase in truck traffic which can add significant wear and damage to local roads, create congestion, and produce local air pollution. Concern has also been expressed regarding an influx of temporary workers and the impact to a community’s way of life. An increase in oil and gas workers can result in increased rental housing and labor costs, increased crime and, subsequent, public safety costs, as well as more demand for health and education services. There may be more pronounced impacts on local communities as drilling operations involve lights 24 hours a day and noise pollution in the initial month of drilling. There can also be issues with localized air pollution, odor, and glare from flaring. the Watershed Council’s primary focus is on the potential adverse impacts to our waters. Water withdrawals can reduce water storage in aquifers which in turn may reduce discharge to surface waters, or increase recharge from other sources to fill the depleted aquifer. The withdrawal of surface water can also directly reduce the flow in streams and the water levels in lakes and wetlands. In general, more water is needed to hydraulically fracture a well with a longer wellbore. Based on current activity in Michigan, an average of 7.5 million gallons of water are used to fracture each well. However, almost all of the water withdrawn for hydraulic fracturing in the Great Lakes Basin will not be returned to the source watershed to replenish water resources; instead, the water will be placed underground during use or for disposal. By law, surface water withdrawals are prohibited for drilling operations and are discouraged for fracking operations. Therefore, the source of water used in fracking is typically groundwater. Oil and gas operations are exempt from the registration and permitting requirements under Part 327, Michigan’s Water Use Law, which regulates large quantity withdrawals. In 2015, MDEQ revised the administrative rules to address concerns of water withdrawals associated with high volume hydraulic fracturing. While oil and gas activities remain exempt from Michigan’s Water Use Law, the amended rules require operators to obtain approval for a large volume water withdrawal for high volume fracking operations. This requires an evaluation of large-volume water withdrawals using the MDEQ’s Water Withdrawal Assessment Tool (WWAT). The WWAT is designed to estimate the likely impact of a water withdrawal on nearby streams and rivers to confirm that a withdrawal will not cause an adverse resource impact. Errors in well construction or spills during transportation can occur and lead to water contamination. Fluids can spill before they are injected and fluids recovered from fracturing can contaminate surface waters. Additionally, drilling into these formations can create pathways by which fluids or natural gas itself can find its way into water supplies if drillers are not careful. Of greatest concern is that fracking uses hundreds of chemicals, which are mixed with water and pumped underground, directly through aquifers, to fracture rock. Many chemicals used in the fracking process are “undisclosed” from the public because it is considered to be a trade secret and proprietary information. The chemical constituents in fracturing fluid range from benign substances to those that have acute or chronic health effects. Fracking fluid is typically 99 percent water and sand (or other granulated material) and approximately one percent chemicals. However, when millions of gallons of water are being used, the volume of chemicals per fracking operation is very large. The U.S. Environmental Protection Agency (EPA) estimates that a well stimulated using 6 million gallons of fracturing fluid would be injected with 30,000 to 120,000 gallons of chemical additives. Michigan’s amended administrative rules for high volume hydraulic fracturing, which became effective March of 2015, require operators to submit information on chemical additives used in a fracking operation using the internet-based FracFocus Chemical Disclosure Registry (http://fracfocus.org/) within 30 days after completion of the fracking. Once the fracking process is complete, anywhere from 25-75% of the fracture water comes back to the surface. This means that each well produces millions of gallons of wastewater, called flowback and produced water, which will have to be disposed of. Options for disposal include underground injection wells, discharge to surface waters, and use of commercial or publicly-owned treatment facilities. Another option used elsewhere in the country is for the waste to be treated and re-used in another fracking job. In Michigan, the law requires that the waste be disposed of in deep injection wells. However, because these fluids are part of an oil and gas operation, the fluids are designated as an oil and gas waste, even if there are hazardous chemicals in the wastes. This designation results in less protective requirements for the construction, operating, monitoring and testing, reporting, and closure for well owners or operators. Applicants who wish to inject wastes associated with oil and gas operations in a disposal well do not have to identify hazardous waste components in their analysis of the waste product. Additionally, oil and gas injection wells are exempt from local zoning.